Vladimir Putin’s return to the Kremlin gave the police and security forces an opportunity to take revenge for their losses during Dmitri Medvedev’s presidency. Practically all of the initiatives of the former Russian president and current prime minister have been revised­ – a state of affairs that Medvedev has usually taken lying down. However, in November, for the first time in eighteen months, Medvedev decided to publicly criticize a bill introduced to the State Duma by Putin. In response, the president as good as threatened the head of the Russian government with dismissal. According to political analyst Tatiana Stanovaya, Russian business is being put at the mercy of the security forces. Despite all the criticism of Medvedev as a weak president who promoted ridiculous initiatives, he did take a number of important steps in the areas of anticorruption law, transparency of government agencies, better public control over state acquisitions, and liberalization of criminal legislation. This is the point of view of many businesspeople, economists, and journalists from independent media outlets. Vladimir Putin, however, does not agree with his former successor about the need for such steps. According to the current Russian president, liberalization did not produce the right effects and played into the hands of criminals. Liberalization affected a number of laws by reducing the pressure that supervision agencies and law enforcement bodies used to apply to businessmen. One such initiative was the adoption in December 2011 of amendments to Russia’s Criminal Procedural Code that aimed at improving the criminal procedure for handling economic crimes. On December 6, 2011, then-President Medvedev signed federal law No. 407-FL, “On Introducing Amendments to Articles 140 and 241 of the Criminal Procedural Code of the Russian Federation,” into effect. The amendments to Article 140 (“Reasons and Grounds for the Institution of a Criminal Case”) stipulated that the decision to initiate criminal proceedings for tax-related offenses (Art. 198­199.2 of the Criminal Code of the Russian Federation) can only be based on documents presented by tax authorities. The amendments to Article 241 (“Openness”) established that when considering criminal cases related to crimes in the economic sphere, only the introductory and resolution parts of a court decision can be made public. Medvedev’s logic was transparent: he believed that law enforcement bodies were abusing their right to initiate criminal proceedings for tax-related crimes without good reason, which resulted in them using this right as an excuse to launch raids against Russian businessmen, extort bribes from them, and engage in other backdoor behavior. The price list for closing such cases had even been published in the media. This is why it was decided that only materials presented by tax authorities­and not materials pertaining to the investigative activities of the police and security forces­could serve as a reason to initiate criminal proceedings for tax-related offenses. As Putin rightly observed, their objective being tax discipline, tax authorities are not the same thing as law enforcement bodies. So in 2011, Medvedev decided that it would be better if tax authorities possessing evidence of tax evasion sent their materials to law enforcement bodies, which would conduct further investigations. At the same time, the Russian Investigative Committee (RIC) was given the right to initiate criminal proceedings for tax-related offenses, a power that had previously been vested in law enforcement bodies. This gave a certain privileged position to the RIC, which was run by Alexander Bastrykin, who used to be Putin’s fellow student. The committee could not use these powers to their full extent, though. 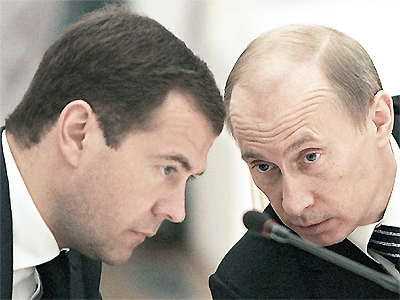 An opportunity to change the situation came one year after Medvedev left the Kremlin. In summer 2013, the RIC began working on a draft law to annul his amendments, which it submitted to the government and the presidential administration for consideration in mid-September. At the time, the cabinet laughed at the bill, considering it a nonstarter. However, the bill was introduced to the State Duma by the president over the heads of government officials: according to Vedomosti sources, many of them were shocked by the news. For the first time since he became prime minister, Dmitri Medvedev publicly opposed the initiative: “Anything can be initiated, especially on order and for money, which often happens when one structure fights against another one,” Medvedev said during a meeting on November 12. The Ministry of Economic Development prepared a negative assessment that might be used as a government opinion against Putin’s actions (even if the government’s input is not required in this case). As a top government official told Vedomosti, the government is searching for ways to torpedo the president’s bill: “We are looking for formulations.” Although it will not be possible to simply withdraw the bill, the prime minister has made it clear that the document cannot be adopted in its present state. The Ministry of Economic Development has stated that a return to the old order would affect the investment climate and hinder the development of small and medium-sized businesses. The Ministry is also afraid that a repeal of the current initiative might result in an abuse of power by investigating agencies. Deputy Prime Minister Arkady Dvorkovich declared that he was against the introduction of the RIC’s amendments. “I believe that there is yet no reason to have two keys here,” Dvorkovich said in an interview with TV channel Rossiya-24. According to him, the current system is rational and the federal tax service has all the opportunities it needs to work effectively. The RIC initiative came as a shock to the business community as well. President of the All-Russian Insurance Association and former chairman of the Management Board of the Institute for Contemporary Development Igor Yurgens stated that Putin’s new initiative completely contradicts the logic of and trend toward modernization in the economy, as well as the trajectory of relations between business and the government, potentially preventing the investment climate in the country from improving. Also, according to Yurgens, problems with tax collection­an issue that concerns the Russian authorities­are not caused by small and medium-sized businesses refusing to pay their taxes, but by the Customs Union: Russia lost a considerable amount of value-added tax on goods imported from China, which are now going to Kazakhstan instead. The all-Russian nongovernmental organization OPORA Rossii (the Russian Public Organization of Small and Medium Businesses) is categorically opposed to the initiative as well. The RIC, however, argues that the capital outflow related to dubious operations, the government’s plan to mobilize budget revenues, and the de-offshorization of the Russian economy justify the broadening of the committee’s powers. It is also worth mentioning that the Investigative Committee is supported by the Finance Ministry, an association explained by the Finance Ministry’s corporate interests. One of Putin’s arguments is that tax authorities are not law enforcement bodies. “What has happened is that we have essentially made the tax service responsible for the decision to initiate criminal proceedings. The tax service does not initiate them, but that is essentially where the decision is made,” the president said. Putin is actually distorting facts: the Investigative Committee has the exclusive right to decide whether criminal proceedings should be initiated or not. In fact, tax authorities can only examine cases up to three years old, whereas the statute of limitations on tax-related crimes is ten years. This problem, however, could easily be solved by extending the time frame of tax authorities’ right to examine cases. However, this solution does not satisfy Putin either­too few convictions. “In all the cases that have been investigated, only three people have been apprehended as a result, and two of them received suspended sentences,” the president said. Putin chose the path of boosting the repressive machine. At the same time, he made it clear that all those displeased, including the Russian prime minister, can resign. At the time, many wondered how the RIC’s official spokesman, Vladimir Markin, had ventured to engage in a public dispute with Deputy Prime Minister Vladislav Surkov. After Putin’s most recent rebuke, no one finds it surprising anymore. During the November 14 meeting, the president criticized Medvedev for publicly disagreeing with him. “Naturally, all of us want to seem warm and fuzzy, as they say, and liberal. But that is not our objective. We are not performing artists. . . . I will talk with my colleagues and we will figure things out, but this issue can be resolved very simply. I will be obligated to remind them that there are certain practices in resolving such matters before going to the media. As we know, if somebody does not agree with something. . . . As Mr. Kudrin did­he crossed over into the expert community and will now work with us, basically, in the Presidential Expert Council, which is also good, and I very much count on him to bring a lot of useful contributions to our discussions and to the preparation of our decisions,” Vladimir Putin said­in so many words threatening Dmitri Medvedev with dismissal. A tax culture and discipline problem does indeed exist in Russia. Unlike in Western countries, where tax-related crimes are strictly punished, in Russia, tax evasion is not something to be ashamed of; it is even sometimes considered an honorable action. However, in order to encourage social responsibility among the business community and an understanding of why taxes are supposed to be paid, it is important to increase the responsibility of the state toward taxpayers. When business does not trust the authorities and the real tax burden is considerably higher than the official one because of corruption and “administrative terrorism,” it is not surprising that tax evasion has become a fact of everyday life. Citation of material from this website is allowed without obtaining prior permission, provided that it includes a link to the original page. Link should be placed directly in the body of the text, immediately following or preceding the citation.